Bakery equipment is for the handling, portion forming the final size of a bakery dough for subsequent processing. Bakery equipment refers to different types of machines that can be used in the production of bakery goods and products. More specifically, bakery equipment handle the dough used in the production of bakery goods. Depositors deposit dough or product onto the dough. Sheeters create a sheet of dough from a pre-mixed mass of dough. Rounders portion out pre-mixed dough into predetermined sizes. Dual lane walking beam fill nozzel system for soft pie filling. Requires depositor for filling. Equipped with adjustable centers currently set at 11-1/2", discharge ports with ID 1-7/8" and OD 2-1/2" and E-Stop. Mounted on casters. 20 head, inline cake pan greaser, rated up to 100 cycles @ minute depending on application. Has 20 metering pumps, and nozzles on 48" wide product depositing bar, set-on 2" centers. 108" long product conveyor, PLC controls, with 7 function dial control, flight bar, and pan sensors, pan count and pans per minute display, all stainless steel construction, and is mounted on common base with casters for mobility, and was last running in a commercial bakery operation. Stainless steel rotary drum topper. Equipped with a 41" wide x 21" long x 18" deep trough with breaker bar agitation and rotary deposit bottom powered by a ¼ Hp drive and air knife finisher. Unit mounted on 38" wide x 70" long stainless steel Mesh belt conveyor with leveling pads and (2) 16" wide chutes for product reclaim. Control panel includes variable speed controls for both depositor and conveyor. Stainless steel conveyor mounted guillotine. Equipped with a 32" Wide x 85" Long canvas conveyor powred by a 1 hp drive with a 35" to 40" in feed and discharge range and 32" Wide mechanical cutting knife blade powered by a ¾ hp drive with cage style safety guarding. Control panel with variable speed controls for conveyor and knife. Mounted on a painted frame with leveling pads. Rondo, Model ZGV600, stainless steel, inline dough dusting and cutting system. Rated from 10 to 50 stokes per minute with number of product – depending on materials, application and machine configuration. 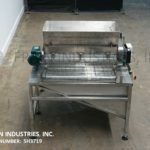 Equipped with 24" wide x 305" long Neoprene belt, 33" wide ribbed dough tension roller, dough duster with 9" long x 22" wide x 15" deep stainless steel product hopper, (2) sets of slitter wheels, (1) 18" wide die cutter roll and 25½" wide reciprocating guillotine knife. Control Panel has push button start / stop, variable speed dial, jog switch and E-stop. Mounted on stainless steel base frame. 3 roll, automatic, counter rotating roll, dough sheeter / extruder with amount of product per hour – depending on materials and application. Equipped with (2) 8" OD x 18" long top corrugated, rollers and (1) 12" OD x 18" long smooth bottom roller with open frame design. Control panel has 2 A/B vari speed controllers and 2 hour meters with start / stop push button controls and vari speed control dials Mounted on heavy duty base frame. Hinds-Bock, Model 6P-08, automatic, 6 head, air operated piston filler. Size range: 1 oz to 8 oz with proper change parts, Equipped with 41" long x 19" wide x 15" deep stainless steel product hopper (6) 1¾" ID x 7" long air assist pistons, with rotary shut-off pneumatic package and e-stop. Mounted on H style base frame with casters. 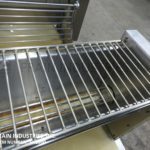 Stainless steel, single row sandwich machine with (2) 128”, adjustable magazines to handle a variety of basecake sizes. Capable of doing 200-700 cookie and cracker sandwiches per min. Has a cookie size range from 1 5/8–2 9/16—the rails are adjustable. Depositer capable of filling creams, jellies, peanut butter and jams. OAD:81" long x 32" wide x 65" high. Automatic, stainless steel, pastry folding machine rated up to 9,000 products per hour – depending on materials and application. Fold types: two fold, four fold, star, and diamond. Dough square sizes: 75mm x 75mm, 100mm x 100mm, 125mm x 125mm, and 150mm x 150mm. Dough thinkness: 2.5mm to 5mm. Equipped with a 36" long x 25" wide neoprene infeed conveyor, cutting wheels, 120" long fixed station carrier system, forming trays, 6" diameter x 25" long roller press, two sets of folding plows, bottom up folding station, 48" long eagle belt discharge and stainless steel guarding. Mounted on casters. Automatic, stainless steel, two way cutting conveyor rated up to 1750 rpm – depending on materials and application. Equipped with a 30" wide x 78" long Neoprene belt, eight 5" diameter cutters set on 1" diameter shafts with 1.5" of height clearance. Additionally has an excess dough reclaiming system. Mounted height adjustable legs and locking casters. APV Baker Model 1506-48 Flying cut-off knife, used in conjuction with a conveyor or oven equipment for cross cutting of passing product. Equipped with (15) 6" diameter cutting blades adjustable for angle cuts set on 12" centers fitted with removable blade scrappers and mounted in the middle of 64" long x 6" wide dual rotary chain and sproket assembly with 1 Hp drive and Reliance SP500 variable speed controller and end mounted brush system (needs brush assembly). Control panel with brush continous / intermittent or off and forward / reverse control switches with e-stop.